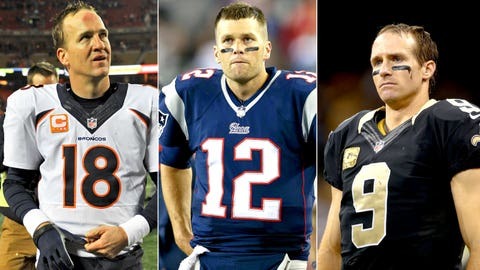 With a month to go, can Manning take down these guys’ records? Peyton Manning (left) has eyes on Tom Brady's and Drew Brees' records. When the calendar turned to November, Peyton Manning was supposed to enter the difficult portion of his schedule. After defying age and injuries in shredding opponents for 29 touchdowns and 2,919 yards through the season’s first eight games, the Denver opponents would do what Father Time could not — slow down the 37-year-old Manning (at least, that was the conventional wisdom). Well, four games and one month later, and Manning certainly has looked more like a 16-year veteran with diminished arm strength on the tail end of his career. But while November brought with it the Broncos’ second loss and Manning’s worst two games of the season (3 TDs, 1 INT, 473 yards combined vs. Kansas City and at New England), his 403-yard, 5-TD monster at KC on Sunday (the first day of December) has him within range of two of football’s most hallowed passing marks with just four games left. Here is a look at where Manning stands in his pursuit to those two records (relative to the season the record was set) and what remains ahead in 2013 as he chases history. Tennessee and Houston sport impressive pass defenses, but with all his years in Indianapolis, Manning has quite a large sample size against both the Titans and Texans. And it is an impressive one — sort of. In 18 career games against Tennessee, Manning has 31 TDs and 4,559 yards; big numbers, to be sure, but when averaged out per game, not enough to maintain the pace needed to get the records. But once Week 16 rolls around, look out, Brady and Brees. In 19 games against Houston, Manning has 44 TDs — his most against any opponent in his career. His 5,452 yards are second only to his career total against Jacksonville, but he has played one more game against the Jaguars. His average against the Texans is 2.3 TDs and 286 yards — on pace for the TD mark and less than 50 yards from the yardage average needed. In 18 career games combined against the Chargers and Raiders, Manning averages nearly 2.3 TDs and just under 300 yards per game. But if recent performance is any indication, he can make a strong run at the marks — against Oakland in Week 3, Manning threw for 374 yards and 3 TDs; at San Diego in Week 10 (the start of the supposedly wicked November run), Manning had 330 yards and 4 TDs. If Manning does take down Brady’s TD mark, Tom Terrific may have himself to blame as much as anybody. When the Patriots beat the Broncos in Week 12, it knocked Denver into a first-place tie with KC in AFC West, and drew New England within a game of Denver for the top seed in the AFC. In beating the Chiefs for a second time on Sunday, the Broncos moved a game ahead of KC in the West and own the tiebreaker by virtue of a season sweep; in essence, a two-game lead with four to play. But the Patriots sit only a game behind the Broncos in the race for the No. 1 overall seed in the AFC playoffs. And because New England beat Denver, a tie in the standings would give the Patriots the top seed. So as long as the Broncos remain no more than a game ahead of the Patriots, expect Denver to keep on trying, and Manning to keep on chucking, all the way through the final play of Week 17.